Here is the recipe for these sinful bars I like to bake and give as Christmas goodies to people I like. Then I bake a batch just for me and snack on them out of the fridge until I get a sugar headache. 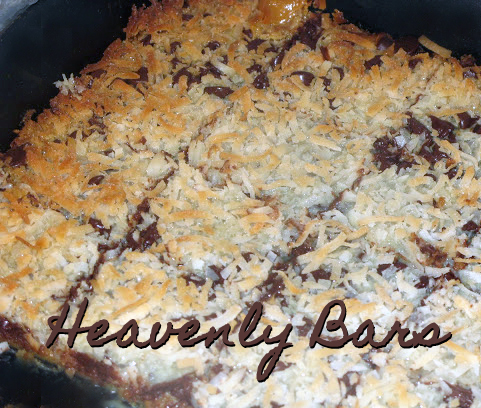 These Heavenly Bars rock! Melt the butter and pour it in a 9×13 pan. Sprinkle the graham cracker crumbs over it and mix it all up. Pat it down in the pan. Pour the milk evenly over the crumbs. Sprinkle on the chips and coconut. You can add nuts if you like them. Press it all down with a spatula. Bake 20 minutes at 350 degrees or until golden brown. Cool for 1/2 hour then cut into bars. These are so good straight from the fridge! ONLY 200 calories and 11 grams of fat per bar (ha!)! Now you know why I’m gaining back all the weight I lost last spring!!!! !